As the Tet (Lunar New Year) holiday already came to an end, workers have returned to work on the massive construction site of the first-ever metro line in Ho Chi Minh City on Tuesday, with the project management hoping to overcome funding difficulties to speed up completion of the late-running megaproject. All construction works on the city’s metro line No. 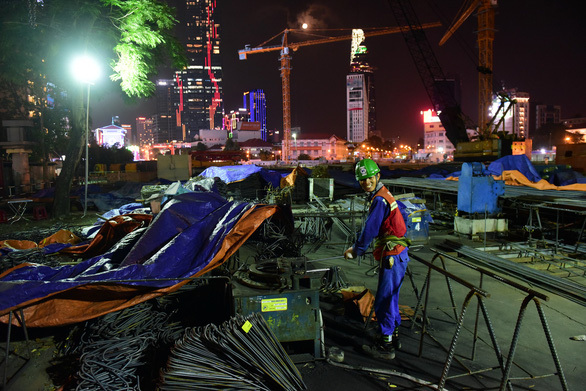 1, which connects Ben Thanh Market in District 1 and Suoi Tien Theme Park in District 9, was resumed on Tuesday, with workers actively doing their job in the hope of having luck in the new lunar year. One of the most significant parts of the metro line is the 17.1km metro bridge, or the elevated railway of the project that runs along Hanoi Highway, snaking through District 1, Binh Thanh District, District 2, District 9 and Thu Duc District to connect the Ba Son Shipyard and Suoi Tien terminals. At one section of the metro bridge, dozens of engineers and workers were installing the two lanes of rail during their first working day after Tet. As of Tuesday, around 6,000 meters of rail lanes and 2,700 meters of concrete floor of the metro line have been completed and are being examined by both Vietnamese and Japanese engineers. 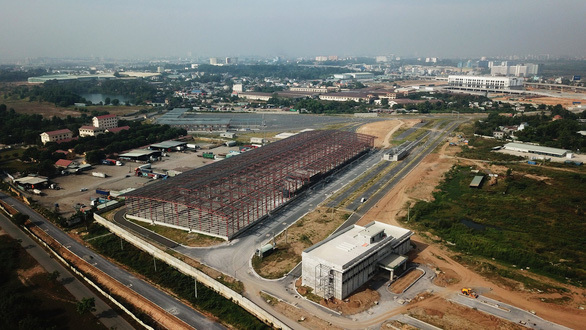 Another key section of the metro is the Long Binh depot, a technical station situated in a 22-hectare area spanning from Ho Chi Minh City’s District 9 to Di An Town of the southern province of Binh Duong, where the metro trains will be maintained. The basic construction of the depot’s operations control center (OCC), where engineers will monitor and control all the activities of the trains running on metro line No. 1, has been completed. According to the design, this OCC will be equipped with automatic electronic operating devices and surveillance camera systems in 2019 and 2020. Meanwhile, an area that can houses 32 metro trains, each with six rail cars, and a 21,560 square meter repairing area are also near completion. The 19.7km metro line is mainly aboveground, with a 2.6km underground section. It is expected to be put into service by 2020. By the end of 2018, the project had been 62 percent completed, while it was supposed to reach 65-percent completion that year. Bui Xuan Cuong, head of the Management Authority of Urban Railways (MAUR), attributed the late progress to funding issues and staff changes. “While we initially planned to have 77 percent of the project completed by the end of this year, we now target to reach a completion rate of 80 percent,” Cuong said. The development of the Ben Thanh – Suoi Tien metro line began in 2007 using official development assistance (ODA) loans from Japan. It is estimated to cost VND47.3 trillion (US$2 billion), and will be capable of transporting 620,000 passengers per day upon completion, taking pressure away from the city’s crowded public transport system that is overly dependent on buses. However, since October 2017 the project has not received any budget disbursement due to late approval of an adjusted investment plan. Cuong said local authorities are racing to complete legal procedures to resolve this financial problem to ensure construction progress for the project.